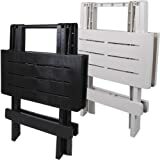 Fold-up side table decking table camping table plastic white the weather-resistant and compact table made of plastic and makes a great small side table in the garden, on the terrace, the balcony or for indoor use. Plants and decorations come with the spacious and easy care side table it’s good to the fore. Allows you to make the table when not in use folds up for space saving storage. Material: Plastic Dimensions (L x B x H): approx. 43 x 45 x 50 cm when collapsed dimensions (Length x Width x Height): approx. 44 x 56.5 x 5.5 cm Colour: White or Black, Maximum load: 12 kg Box contents: 1 x Side Table in Choice of colour we also provid custom service, just design follow your in our shop.